During the overnight hours in the US, big events were taking place at the Kokugikan in Tokyo. Some of what I had mused about in last night’s preview thread actually came to pass, but not quite the way it was expected. As a result the landscape of who may or may not win the cup this time had changed dramatically, and Goeido is all but unstoppable. Takayasu defeats Harumafuji – I am overwhelmingly impressed with Takayasu this tournament. This bout was all Harumafuji, he opened hard and pressed the attack using many of his most effective moves. Harumafuji pushed Takayasu to the straw bales, and it looked like he was about to go out. But Takayasu found enough of a hold on Harumafuji to force him off balance and throw him out before Takayasu himself fell. Amazing performance from a rikishi who may be the next Ozeki. Tamawashi defeats Endo – The last Sekitori in the hunt was Endo, and he went into the clay thanks to Tamawashi pulling him down. Goeido is our likely tournament winner at this point. He would need 2 losses to make him compete for the win on the final day. I’ve come to the conclusion that in a secluded area of Tokyo, Hakuho’s been able to hack into Goeido’s shell and compete this tournament – in spite of the toe. I have been wondering that as well, could this version of Goeido actually be some kind of man-droid, under remote control of a recovering Hakuho? Also, did Harumafuji look hurt to you today? I am trying to figure out if that knee is giving him problems now. How sad will be be if Goeido takes the yusho, leaving Kisenosato as the only Ozeki never to win a tournament. 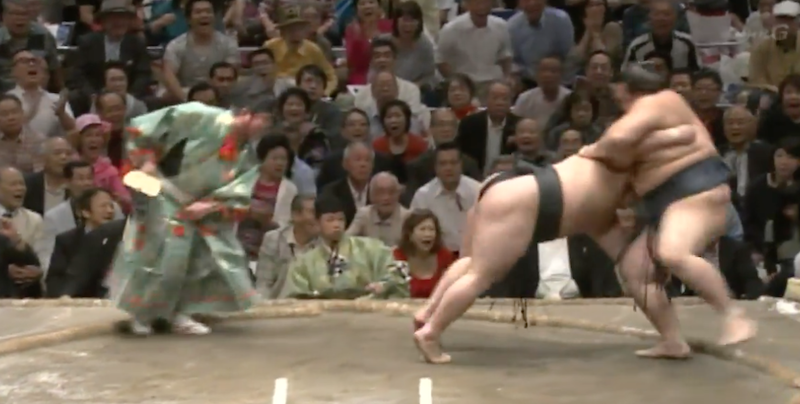 I know I razz Kisenosato on this blog, but I do really feel for the guy. It would be quite the bizarre situation where the only ozeki (translated as champions) with actual CHAMPIONSHIPS are also continually kadoban while Kisenosato plays the role of the nightmare bridesmaid. I didn’t think Harumafuji seemed particularly injured or poor form. Like you mentioned, he seemed to be the aggressor against Takayasu. I think since he usually has such a weight disadvantage his form is a bit less controlled, more unhinged, than other wrestlers. It may make him more prone to injury but it also seems to be inherently riskier. I would call your attention to the 40:48 on the video. Takayasu has his heels on the tarawa, Harumafuji has a right hand under Takayasu’s arm and a left hand on the mawashi. He is almost at 45° and about to give a massive shove to send Takayasu out. This is the same move he used against Hakuho on day 15 in Nagoya, and he does it well. Harumafuji pivots his hips and has a double hand grip on Takayasu, it’s curtains for the big pre-Ozeki. The push starts, the left knee collapses at the moment it was to provide all the thrust to finish Takayasu. Takayasu reads this instantly and pivots to pull the now off balance Harumafuji’s to his side and down. It’s amazing to watch Harumafuji head for the clay, and still working to bring Takayasu down, in essence to “fall last”. Harumafuji is even more impressive in slow motion and freeze frame. Ok, this is the moment I wanted to show. Harumafuji’s knee gives out just as he goes to finish Takayasu. With his leg in that position he has no power, and Takayasu is just starting a twisting throw. I worry the torque applied at this moment applied shear to Harumafuji’s already somewhat weakened knee and something gave way. Ok, sorry – I am not over-analyzing some of today’s bouts. The Kisenosato / Goeido match – not only did Kise let Goeido set the tone and style of the match, watch Goeido commit to the closing move! at 36:16, Kise finally tries to lock it up and go chest to chest, but his body is mal-positioned and too high. Somehow this magic super-Goeido from the year 2090 reads this and pushes Kisenosato back. I love watching Goeido’s feet at that moment, he never steps more than half an inch above the clay, ready to latch down should Kisenosato regain his balance. Goeido gets him to the center, LEAPS to push him backwards, lands at about a 50° angle and pushes hard with everything he has in both legs. At 36:20, Goeido has committed everything to shoving Kisenosato out. Kisenosato is on one foot, he’s more or less upright, and he is headed to defeat. If Goeido wins this one, this moment is when he showed that he was Ichiban.